At New Forest Oak Buildings, we work with you to understand your unique oak frame structure requirements, taking care of everything from design, manufacture and project management to installation and maintenance. New Forest Oak Buildings provide ‘one-off’ buildings in traditionally constructed oak and in other sustainable timbers. We are always interested in designing oak framed structures, such as oak entrance porches, studios, cabins, summerhouses, garden rooms and retreats. We can also incorporate oak framed elements into a modern block built houses to achieve the look you desire. We can offer a full design service with either a complete project managed service or alternatively supply an oak ‘kit’ with detailed plans and instructions. Whatever size and scale of oak framed structure you choose; you can be sure it will enhance your home and everyday life, whilst also adding long lasting value to your property. We are passionate and enjoy designing & building interesting oak structures. We have a wealth of experience and are flexible and innovative in our approach; therefore we can design and manufacture exactly what you require. 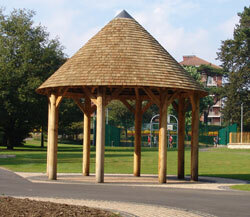 Please see a variety of oak structures & buildings we have completed here and in the gallery.